So, Kyuna san, my Sensei in all things boat mechanics, went AWOL. This is disastrous as, although I can, sand, treat wood , mess around with gratings etc, without him I cannot connect up the engine to the electrics, which have as you know, been underwater for at least 5 years. He knows how to do these things. I do not not. No one has seen him. Out of the blue he answers my phone call and 5 minutes later we are back in business. 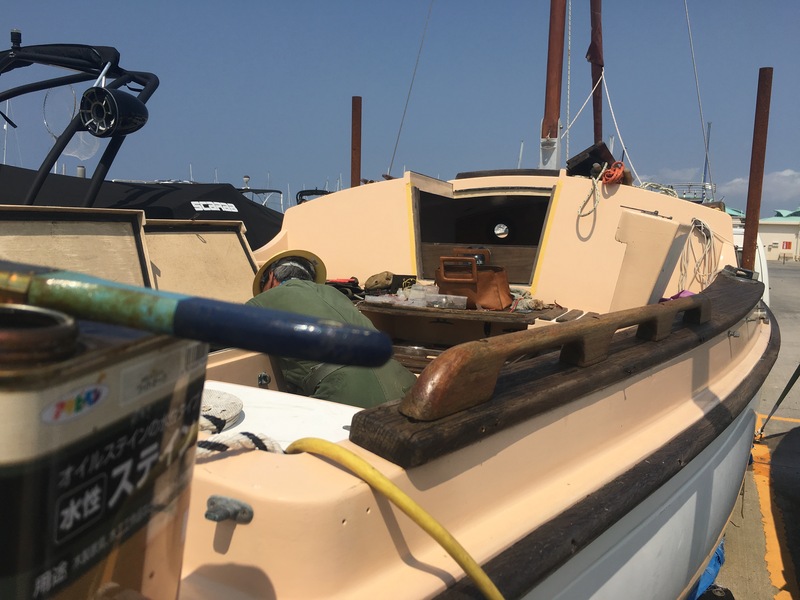 KIyuna san works on electrics as I try to re-treat all the woodwork that has been completely trashed by Okinawan sun. I am anxious. 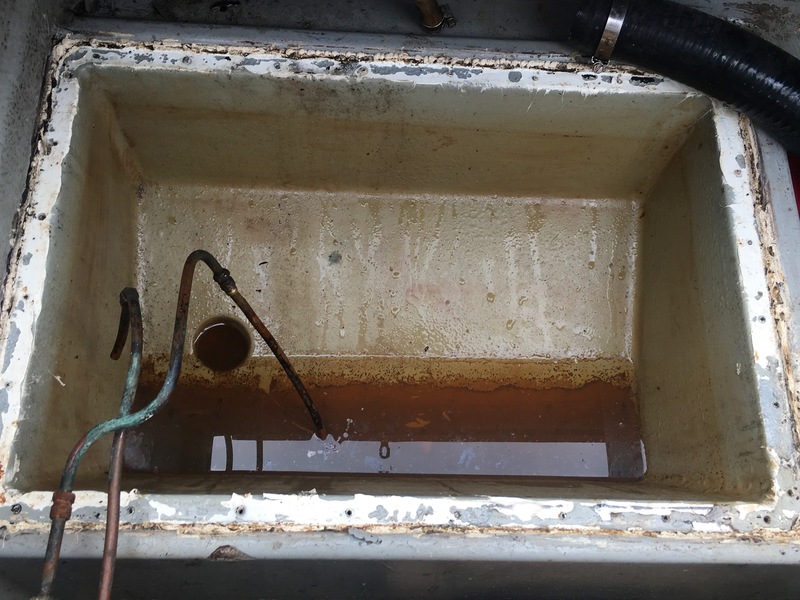 Will we have to rewire the boat, install new fuse box, install new engine starting panel? Kiyuna san is typically nonchalant. Before filling the gas tank with diesel, I have a look at the dipstick. It comes out dripping with water. Water has got into the tank. I rush down early this morning and lift the top of the tank and sure enough there is a quantity of water in it. Phew, good thing I spotted it before we filled it up with diesel and tried to fire up the mighty Yanmar. I clean everything out and reseal the tank. Lots of agonizing scraping off the sealant that I put on about a year ago. Sealant is tenacious stuff. Kiyuna san breezes in and in no time has filled the tank, set up a water cooling circuit and bled the fuel system. I turn on the main electric switch, turn the key on the starter panel and amazingly lights flash and signals sound. I press the starter button and thunka, thunka she starts! Yay cooling water ejected from stern! 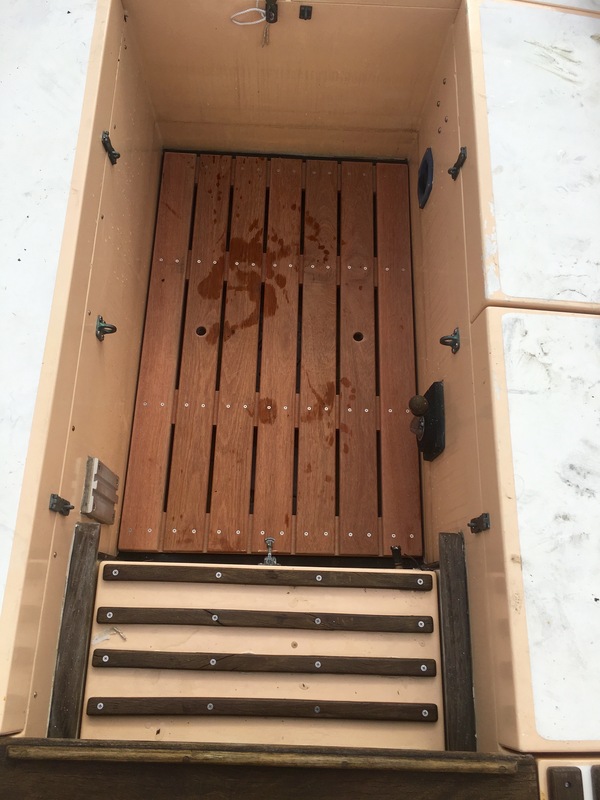 Automatic bilge pump. Gulper is wonderful. A bit like standing behind a cow. So, everything seems to work. A miracle! My luck holds strong. Hats off to the builders back in 1992 for producing such a robust system. New, er modified grating, looks great!